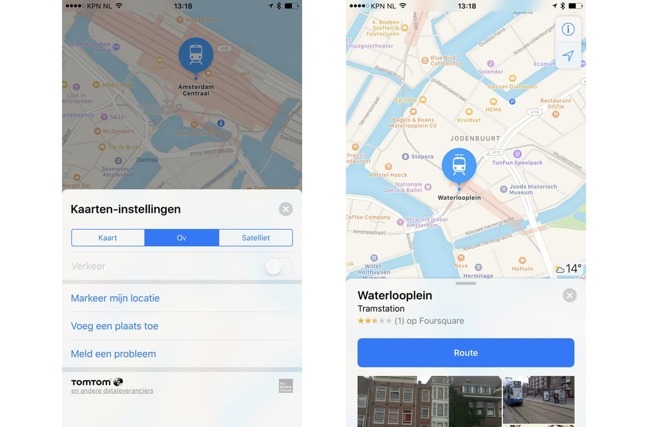 Apple has expanded its mass transit information to the Netherlands, with the full set of data involving stations, tracks, and other stations coming online on early Saturday morning —but live train and bus data is not yet available. First spotted by iPhoned, the latest update adds "train, tram, and metro stations" in the app for larger Dutch cities. It is unclear if or when the live data will be added, but the publication speculates that it will likely be added before June's WWDC. In the last month, Apple has added public transit information for Adelaide, Australia; Paris, France; and Singapore. Despite recent expansion, the majority of Apple's mass-transit data centers around the company's critical U.S., U.K., and China markets. Transit directions were briefly stripped out of iOS starting with iOS 6 in 2012, when Apple decided to purge all Google Maps content. The feature was restored three years later with the launch of iOS 9, and has gradually added cities while implementing features like bike and electric vehicle charging stations. Apple is expected to release iOS 11 at the June WWDC, with rumors suggesting that indoor mapping and enhanced car navigation will be added, as well as more regular content updates by way of drone imagery.